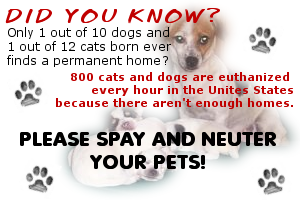 Pediatric or Early Spay/Neuter refers to spaying or neutering pets at a much earlier age than the old six to nine month standard. With today’s anesthetics, advanced monitoring equipment, and surgical techniques, not only are these procedures safe in young puppies and kittens, the risk of complication is lower and the recovery period shorter than in mature pets. Concerns about adverse effects have now been proven unfounded. 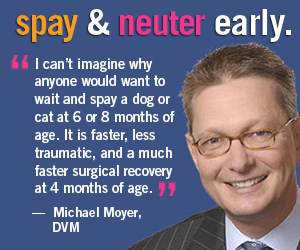 The American Veterinary Medical Association, the Humane Society of the United States, the Association of Spay/Neuter Veterinarians, and the College of Veterinary Medicine at the University of Georgia, are among those that support early spay/neuter. Our shelter has been practicing early spay/neuter since February 1999! If YOU have a pet (or know of one) that might benefit from our low cost spay/neuter program and the dog/cat is friendly and healthy and 8+ weeks and 2+ lbs. pls contact us to arrange a time to get him/her spayed or neutered TODAY! Keep up-to-date with special events and happenings in our clinic and Watch for periodic discounted services. 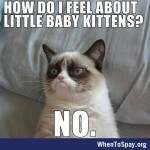 Share our new Facebook site with others who might need low cost spay/neuter resources! It avoids heat cycles, unwelcome visitors fighting on the lawn, accidental pregnancies, unwanted puppies and kittens, inconvenience, and expense. Males and their owners are spared roaming and fighting, and the resulting injuries, spread of disease, and expenses. 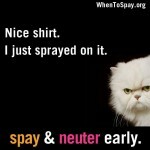 Better-behaved pets – Neutered pets rarely spray or mark, roam and fight. 85% of bites involve unneutered dogs. Healthier pets – Neutered males don’t have testicular cancer or the prostate problems common in intact dogs. Females spayed before their first heat cycle have 96.4% less breast cancer, a common cause of death. They have no risk of uterine infection, or the many complications associated with pregnancy, whelping or raising a litter. It’s safer. Our mortality rate is lower. 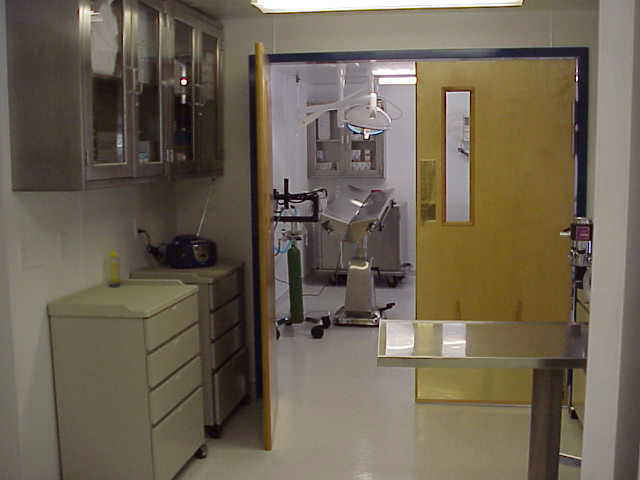 Our vets have performed thousands of procedures and are highly experienced. Complications occur less often. Most compelling, in a study done by veterinary students (completely inexperienced surgeons), their death and complication rates were lower. It’s easier on the pet – anesthesia time is shorter and recovery takes only a few hours. It completely eliminates the possibility of intentional breeding by well meaning, but ignorant owners. The old “so the kids can have the experience”, “just one litter,” “we can make a little money,” or “I found her a good home” that turns out to be a back yard puppy mill. Breeders can avoid having their names show up on poor quality stock and help control competition by backyard breeders. The bottom line is fewer unwanted pets, and fewer ill-bred animals filling up homes so that others go without. Early spay/neuter does require some special training and adjustments to the techniques used in older dogs. If your vet is unfamiliar with these procedures, we would be happy to discuss the techniques with him or her and/or provide research data and recommendations.